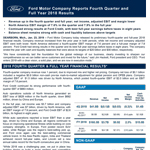 DEARBORN, Mich.--(BUSINESS WIRE)--Ford Motor Company (NYSE:F) today reported its 2018 fourth quarter and full year financial results. Click here or visit media.ford.com to view the news release and visit shareholder.ford.com to view the slide presentation and access the webcast to Ford’s earnings call, which begins at 5:30 p.m. ET with Jim Hackett, president and CEO, Bob Shanks, Chief Financial Officer, and members of Ford’s senior management team.